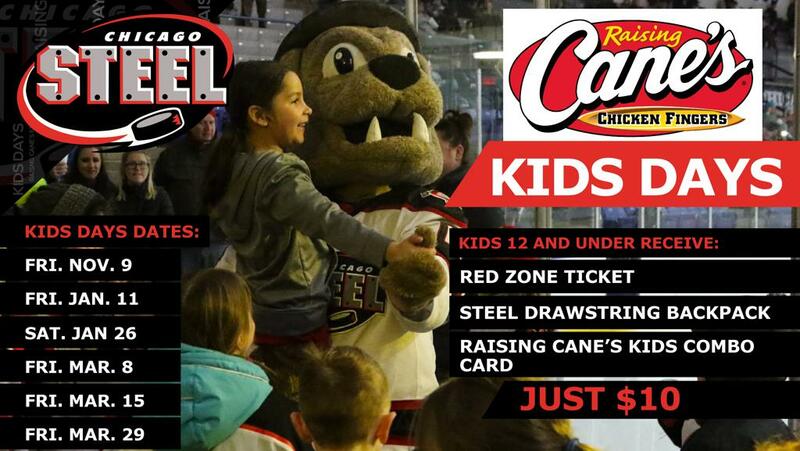 GENEVA, ILLINOIS — This Friday, Nov. 9 marks the first Raising Cane’s Kids Day of the season when the Steel host the Waterloo Black Hawks at 7:05 p.m. Kids 12 and under can receive a Red Zone ticket, Steel drawstring bag and a free kids combo card from Raising Cane’s for just $10. The Kids Day offer is on sale now and provides the perfect excuse for families to spend this Friday night watching the future stars of college and pro hockey. Friday is 70s Night, and the game will feature 70s-based promotions such as the “Rusty Disco Dance Party” and a chance for fans to participate in various other 70s themed contests like a 1970s version of “The Price is Right” and a 1970s Relay Race during intermission. In preparation for the game, Steel players recreated the theme song and opening video from FOX’s That 70’s Show, which is available to view at the team’s website and on its social media platforms. Tickets for Friday’s game, including the Raising Cane’s Kids Day offer, are on sale now starting at just $10 with stadium seating on the glass still available for just $20. The Steel have simplified seating and pricing for the 2018-2019 season and parking is always free. Chicago (4-6-1-0, 9 pts.) comes off two losses last weekend after a pair of tough third periods. Friday night, the Steel fell to Green Bay Gamblers 5-3 after a three-goal third period by the Gamblers. Saturday was much the same as the Steel dominated play against the league-leading Muskegon Lumberjacks but couldn’t overcome four third period goals. Despite not having Mastrosimone, the Steel have offensive weapons trending in the right direction as center Nick Abruzzese is currently on a five-game point streak (2-7-9) and has points in six of the last seven games. Right wing Travis Treloar has goals in five of the team’s 11 games this year and has points in three of the last four (3-1-4). Forward Cole Quisenberry is tied for third on the team with eight points (4-4-8) and has more multi-point games (3) than single point games (2) this season. Defenseman Matteo Pietroniro is the other player with eight points this season (3-5-8) and enters the weekend on a three-game point streak (1-3-4) and has points in six of the last eight games for the Steel. Nick Abruzzese is second on the team with 11 points (2-9-11) this season with nine points (2-7-9) during his five-game point streak. Abruzzese has been hot of late with multi-point performances in four of the last five games after scoring two points in the first six games of the season. Forward Cole Quisenberry and defenseman Matteo Pietroniro are tied for third on the team with eight points this season. Quisenberry (4-4-8) has four points in the last four games (3-1-4) and has three multi-point games this season. Pietroniro (3-5-8) comes into the weekend on a three-game point streak (1-3-4) and scored a beautiful power play goal with a toe drag move around a Muskegon skater in Saturday’s game. Travis Treloar (6-1-7) continues to be among the league’s best when it comes to rookie goal scorers. He is currently tied for fourth with six goals. Among those with six is Waterloo’s Firstov. The Steel will be without leading scorer Mastrosimone (Team USA, U-18 Five Nations Tournament) and defenseman Owen Power (Team Canada White, U-17 Hockey Challenge) this weekend. Power missed last weekend’s games for the Steel as well. 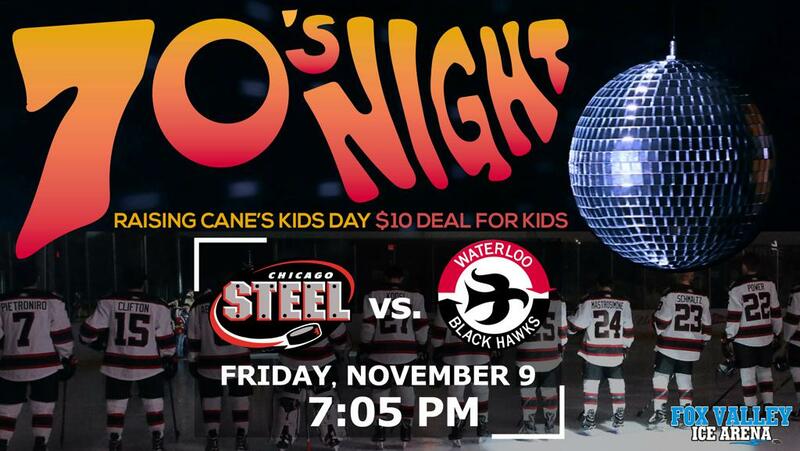 The Steel host Waterloo Friday night for 70s Night as the Black Hawks enter the game tied for first place in the Western Conference. Waterloo (7-2-3-1, 18 pts.) and have picked up eight of a possible 12 points on the road this season (3-1-1-1). Goaltender Jared Moe (10 games, 4-2-2-1) has played the bulk of the games this season but rookie Logan Stein is 3-0-1-0 in five games this season with a 2.96 goals against average and .892 save percentage. Chicago travels to Madison Saturday night for a showdown with the Capitols for the second time this season at Bob Suter Capitol Ice Arena. The Steel won the last matchup 6-2 on Friday, Oct. 12. Madison won its first home game on Friday, Oct. 26 in a 4-3 win over Central Illinois. Defenseman Christian Berger scored the game winning goal on the powerplay. Forward Chaz Smedsrud (3-3-6) leads the team in scoring this season. Goaltender Joseph Lamoreaux (2-5-0-1) has carried the load for the team this season and currently has a 2.50 goals against average and .927 save percentage.